Fitzgerald & Mihalik, LLC is a general practice and personal injury law firm located in the heart of downtown Findlay, Ohio. 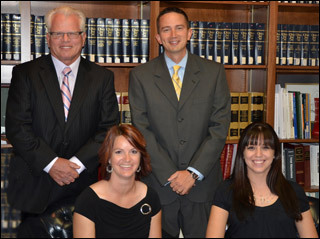 The firm has served clients in Northwest Ohio for 13 years, but has more than 50 years of combined legal experience. Allen, Hancock, Hardin, Henry, Lucas, Putnam, Sandusky, Seneca, Wood and Wyandot. We specialize in personal injury claims, automobile accidents, wrongful death claims and criminal law (Practice Areas). Accident injuries can be severe and obtaining adequate compensation to cover medical bills, lost wages and future lost income requires dedicated representation. Our experienced injury lawyers have access to professional experts who can substantiate the cause of an accident and other party negligence, and estimate damages and future medical care expense. Further, our experienced lawyers have developed expertise in determining whether a settlement offer can meet your needs and whether to pursue further negotiations or take the case to trial. What are the benefits of utilizing the services of a local firm? Our lawyers know the judges, prosecutors and court staff along with the local courts' particular practice and procedures. Whether you are seeking legal assistance for a personal injury claim, estate planning or criminal defense representation, contact our firm today for a free initial consultation.